I skied into the Bennett cabin on Saturday February 18th, 2017. This time I was alone, but I noticed a couple of other parties have signed the book since I was last in on February 5th. The day was glorious, and the snow soft in the 9 deg C temperature. The fire I lit helped dry my sweaty clothes while I munched my lunch. Dan Durst and I have been cabin keepers here for the last 3 years, and everything works. But the trail needs Improvement by someone on a snowmobile with a chainsaw to clear the fallen trees. And in places more Blaze markers are needed, since it's easy to get off track and get a little lost. Hello adventurous classic skiers... 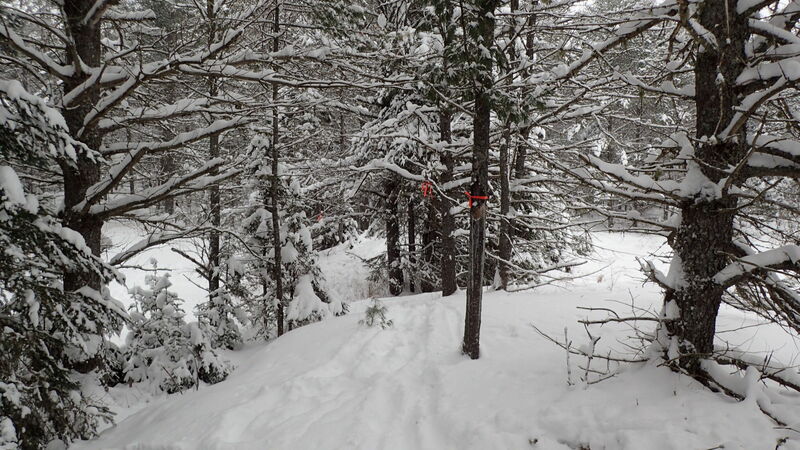 The snow is deep, the trail is marked, and the cabin awaits. b) be able to safely cross water features that may or may not be frozen. Disclaimers out of the way, it is safe to say that there have been skiers up and down the trail, leaving flagging tape to supplement the original yellow metal blazes that have broken off or fallen with their host trees. The southern half of the trail has mostly red tape, the northern half mostly orange. There are some rather large blockages due to fallen trees, around which there are usually marked detours. -Leave early in the day, and be prepared to walk up or down steep hills or across unstable surfaces. Pictured below is a spot where you are strongly advised to un-ski and carefully cross a creek (at 44.68859 -78.09796). Note the triple hanging flags-- they are a hazard warning! This creek and pond can appear to be safe to walk on, but the water is still moving underneath. There are some logs laid across the creek and you can steady yourself with your poles and skis. PS: to the skier who on Feb 10th got to the dome near 44.68971 -78.09708 then turned around... the rest of the route has now been flagged!